Hobart Skin Cancer Clinic uses the state of the art MoleMax skin cancer detection system which is used around the world. In your first visit images of your skin surface will be taken using a high-definition digital MoleMax HD camera. The images will then be stored within the MoleMax software program, the full body foundation mapping procedure takes around thirty minutes. The images are magnified 30x and, using a special polarised light, the detailed structure of the lesion or mole can be seen. Early changes to your skin can be detected as the image is enlarged to fill the entire monitor screen. 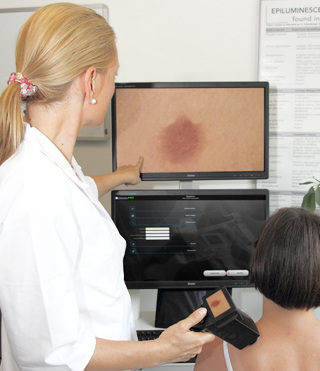 The MoleMax HD system enables the doctor to visually compare a current series of images against the previous images taken to identify changes or the development of new lesions. The comparison of moles using this system results in fewer unnecessary removals. Images can be transferred to a USB drive to take with you if moving interstate or overseas. Single spot checks are also available using the MoleMax HD technology. Some spots on the skin may not require any immediate treatment and with regular skin checks any changes can be monitored. If a spot, freckle, mole or lesion does require treatment, please refer to the examples below. Should lesions require treatment the use of Cryotherapy (dry ice) may be required. Alternatively topical therapy (creams/lotions) may be considered effective. Should a lesion or mole require removal, our skilled medical practitioners are able to undertake these procedures. These procedures may range from simple excision and suturing to excision and skin graft/skin flap repairs. Hobart Skin Cancer Clinic stocks a range of skin care products to protect and enhance your skin.